You know that scene in Mr. Smith Goes to Washington? The one where the good guy, Jimmy Stewart, stands up in the Senate protesting the graft and corruption he sees all around him. He’s not as smart as the other Senators. He was only elected by accident and knows that he’s not properly qualified to sit in the legislature of the United States. This blog is the same. I am, as it happens, a hedge fund manager who’s spent nearly forty years working in the financial markets. As a result, I know a lot about the world’s financial system and how it works. But you don’t have to be a technical wizard to understand these things. The government of the United States owes 115% of American GDP. That’s insane. The Federal Reserve is charged with preserving the value of the currency, but it has printed trillions of dollars in new money. When inflation is galloping away. And the Fed doesn’t even know where those trillions have disappeared to. That’s insane. The Congressional Budget Office tells us that Medicare spending is going to bankrupt the budget. (You can see their chart of federal debt here.) We’re not talking about a few bucks of overspend, but a cost tsunami which will utterly destroy every fiscal rule ever invented. That’s insane. The Tea Party crowd want us to cut taxes, even though we don’t have enough revenues to cover our expenses as it is. And a tax cut when the nation is in deficit is really a tax increase, because you have to pay the money back again, and with interest. More insanity. And Wall Street bosses pay themselves extraordinary bonuses even though their stock prices are tanking. That’s not capitalism as I ever understood it. You can call it insanity if you wish, or criminality if you prefer. Either way, I don’t like it. But these things aren’t confined to the United States. In Britain, we see the same thing: investment banking bosses trashing their company’s share price, bankrupting the government, causing a massive recession – and walking away as multi-millionaires. In Italy, we saw how Silvio Berlusconi, one of the political world’s greatest idiots, presented an ‘austerity budget’ to Italy’s Parliament which made him personally €750 million richer. The European Union announces another ‘rescue plan’ that will impose vast costs on the ‘strong’ governments, but which has obviously failed within a couple of days of the announcement. It’s all insane. And not just insane – it’s wrong. Ethically, financially, and socially wrong. Much of it is also, in my opinion, illegal and should be punished by long terms in jail. This blog is about these issues. It’ll shout out when politicians and bankers do things wrong. It’ll cheer on those rare occasions when politicians get things right. We’ll also talk about the dollar in your purse, the pound in your pocket. The value of your savings is under threat and, as a professional investment manager, I’ll share with you my philosophy on how to preserve your savings from destruction. These are dangerous times and they’re only just starting. 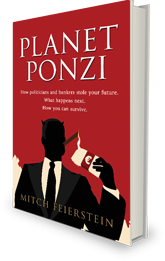 A Ponzi Scheme applies to any investment scheme where the promoter offers crazy returns to attract investors. If you invest your money in such a scheme, you might even get it back – plus some crazy rate of interest – as long as there’s still a flood of money from new investors. But the scheme is still as bankrupt as heck and, once the flood of new money dries up, the entire scheme collapses. And that’s the planet we live on now. Everyone’s borrowing, no one’s paying. And one day, the merry-go-round will stop.